No walking today, just travel day back to Kington to pick up the van and then talk in the evening at Glyndwr University in Wrexham. Awakening to the view of the Llangollen taxidermist, a relaxed morning writing in bed before breakfast, trying to capture the highs and lows of the day before (see “day 21 – Porth-y-Waen to Llangollen“). Richard Picking picked me up at 10am and we meandered our way down the roads to Kington … and there is little alternative to meandering when going north–south along the Offa’s Dyke route. Just as the Dyke cuts across old drainage patterns, it still cuts across modern transport links. It is relatively easy to get to or from the Dyke, but so hard to move along it. Lunch at the Oxford Arms, another one of the once 27 old inns in Kington, and then I picked up the camper van from Fleece Meadow Caravan Site (facilities basic but clean, very reasonable prices) and drove in convoy back to Wrexham. It was odd driving so quickly past places that I had taken days to cover on foot. Also often hard to make out the landscape, seeing hills from different angles from the road. In the evening I gave a public lecture at Glynd&wcirc;r University. Amongst the audience was a lady, Cleopatra, who has two artificial knees and later this year is walking around the entire coast of the Isle of Man. 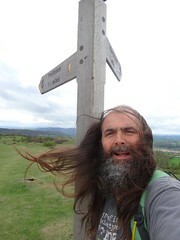 On seeing a photo of me standing by an Offa’s Dyke sign, Peter Excell was reminded that ‘BlueTooth‘, the wireless communication protocol, is named after a Norse king Harald ‘Bluetooth’ Gormsson … why he made the association?? I had thought of Glynd&wcirc;r as one of the ‘new universities’, but in fact Wrexham has a long university history. A government report in the late 19th century suggested two Welsh universities should be founded. However, when Wrexham (historically the largest town in Wales) was not chosen as one of the sites, the people of the town decided to set up their own by pubic subscription. Without royal charter the Wrexham School of Science and Art could not award its own degrees, until over 120 years later, in 2008, it was eventually granted official university status. … a real story of patience! nearly a year to the day by chance I met Cleopatra and Doug (her husband) having a cup of tea in the Caledonian Hotel in Oban while waiting for the Glasgow train. Unfortunately Cleopatra never did the Isle of Man walk as they couldn’t find local logistic support despite substantial promises of financial sponsorship. Although the distances are smaller, the issues are similar to the logistic difficulties I had at different points during my walk. Cleopatra is hoping perhaps to do a walk in Greece as some years ago she did a complete north-south walk across Greece.